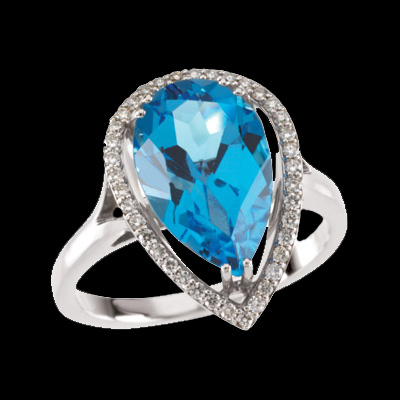 Superior quality 14k white gold Swiss blue topaz and diamond ring. Swiss blue topaz is a pear shape gem and measures 14mm x 9mm, about 5.75ct and SI 2 quality H color diamonds total 1/5ct tw. 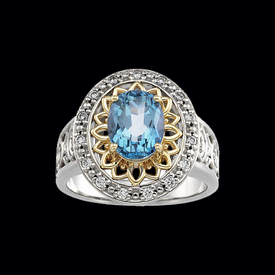 A big, bold, beautiful gemstone and diamond ring, you'll love this one. Big Exciting new design. 14k two tone gold filigree design ring holds a large 9x7 oval gemstone center accented with SI 1 diamonds in the large oval border. Customize this ring with your choice of center gemstone, price shown is with a Sky Blue Topaz. Use our request link for additional pricing.